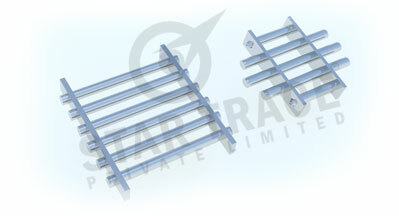 Star Trace manufacturer Filter magnet, Magnetic trap, Hopper magnets, Grill magnet. Star Trace Magnet filters are made up of stainless steel tubes. Each tube consists of an array of permanent magnet discs specially designed and configured to generate high magnet forces. The filters can be supplied using either ferrite or rate earth magnets. The tubes have a diameter of either 3/4" or 1" or 1.5". The filters can be supplied in various sizes with width and length varying from 9 to 36 inches. Circular or rectangular shapes are offered. Customized sizes, shapes and design can also be offered. Grill Magnets are important Tramp iron separators, used for separating tramp iron or ferrous contaminants from free flowing granular materials. Our grill are made of rare earth or ceramic magnets. The grills are aligned in certain angles that attracts the contaminants. Available in various shapes and sizes, our grill magnets have wide applicability in various industries like chemical industries, food processing industries, mining and mineral industries plastic and ceramic industries etc. Grill Magnets offer excellent protection from metal contamination. As product flows over the magnet tubes, captured metal contaminants are pushed to the underside of the tube where they are now out of contact with the product flow preventing was hoff back in to the clean material. The Tramp Iron Separator are made up of magnet elements, which are fitted inside a required size frame. Magnet Elements are made up of hard ferrite ceramic magnets or high intensity rare earth magnets. All the components are made up of Stainless Steel 304/316 material. The overall construction of the grills can also be made as per the customer specification and sizes. As the material flows through the grill, the iron particles are attracted by the magnets and they are trapped over the surface of the element. The trapped material has to be removed manually after removing grill from its location. In case of self cleaning grill the iron particles get trapped over the extra sleeve provided on the elements, they get released as soon as the elements are pushed out of the sleeves.